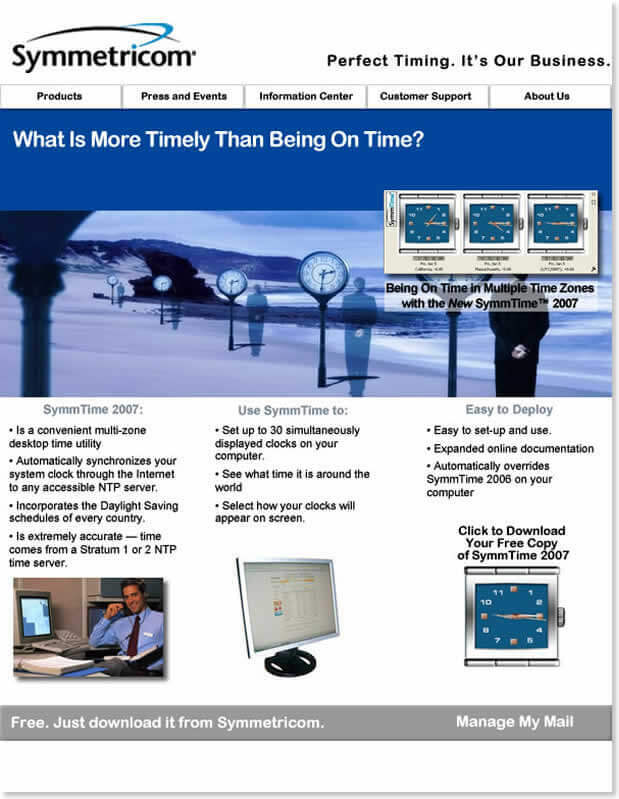 Symmetricom makes network measurement tools and equipment. They wanted to offer their list of customers and prospects a free download for a multiple time zones desktop widget. But their list was old and filled with many bogus entries, including invalid or out-of-date email addresses. In addition, they had begun to suspect the deliverability performance of their newsletter email provider. Symmetricom asked us to help them clean up their email list, test their current email providers against leading email providers, and develop new messaging and new creative for an email that featured their free download. We were also asked to examine the underlying code of their email for best practices in display accuracy across multiple email clients. Using creative images and messaging that clarified and highlighted the offer, HiveMind Marketing developed a highly focused email design for maximum impact. List cleaning dropped the list total from 100K+ names to about 66K names with verified addresses, and consistent, accurate company information. The overall mailing generated an impressive 400% lift in response. Talk with a HiveMind strategist. It’s easy to start a project today! Based in San Jose and Silicon Valley, HiveMind Studios is a creative marketing agency that specializes in branding, advertising, inbound marketing, digital services, and creative concepts for companies around the world.